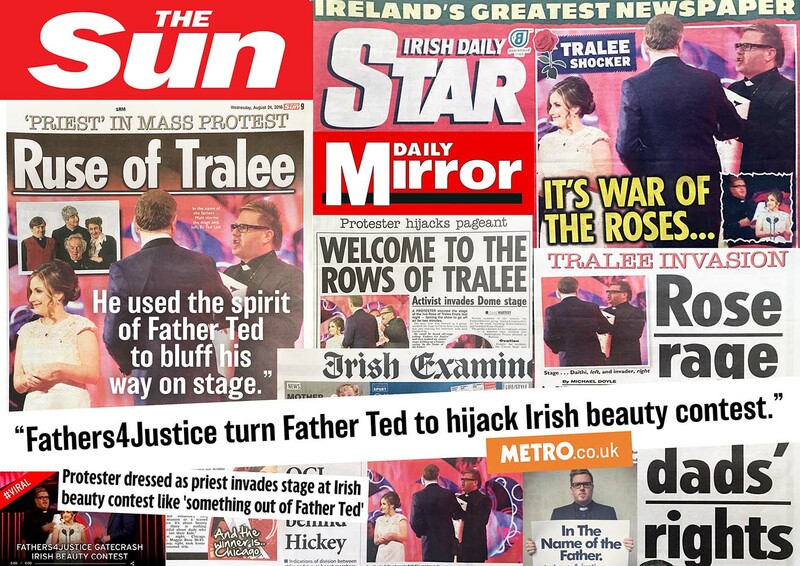 Fathers4Justice founder Matt O’Connor invokes the spirit of Father Ted as he storms the stage of the Rose of Tralee beauty pageant in Ireland. Full story and press coverage below. The inequality and lack of rights facing fathers and the silence surrounding this issue sparked Monday night’s on stage protest at the Rose of Tralee, writes the man responsible, Matt O’Connor. AT the moment fatherhood is not recognised in Irish law or in the Irish constitution and effectively unmarried fathers have no rights, even if their name is on the child’s birth certificate. So to become a guardian a father must either make an agreement with the mother, or meet a “Cohabitation Requirement” to have lived with the child’s mother for 12 months, including three months following a child’s birth. For many fathers this criterion is impossible to meet. In these cases a father may apply to court to become joint guardian or for an Access Order. This can, however, be opposed by the mother under the new “child’s best interests” principle. Imagine the outrage if 100,000 Irish children were denied access to their mothers in this way and imagine the outcry if mums had no right in law to see their children and they had to battle through secret family courts to see them? In a country desperate to bury the mistakes of the past, we seem doomed to keep repeating them. In our illiberal rush to be liberal, we grant ‘equal rights’ to everyone, but have somehow forgotten to include 50% of the population, Ireland’s existing and fathers-to-be. I took to the stage at the Rose of Tralee on Monday night, therfore, to highlight the partitioning of children from their dads, and to break the wall of silence surrounding an issue which should be a national scandal. I have friends and family affected by the cancer of family breakdown and fatherlessness but who are too ashamed to admit it. 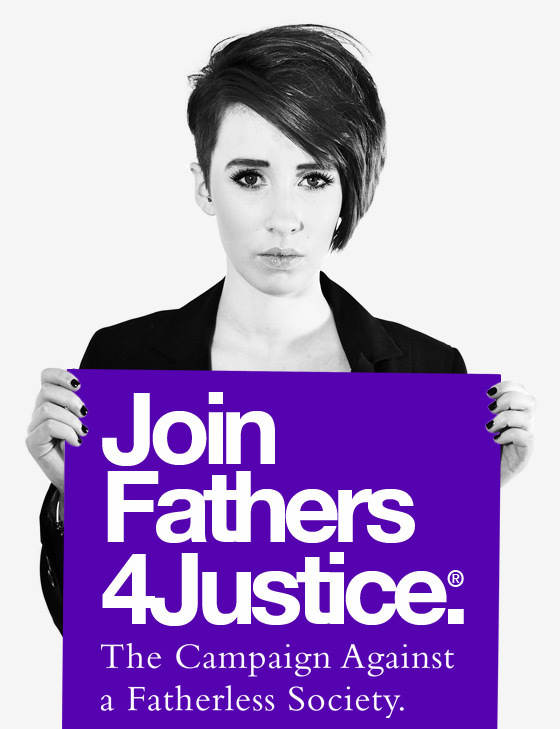 Worse still, the stigma of losing your children, and the cruel and degrading treatment of dads in the courts, is contributing to a public health emergency as desperate dads are driven into depression and suicide. If that isn’t punishment enough the government has reduced us to the status of cashpoints and sperm banks, obliged to pay for children we cannot see. Instead of child support meaning emotional and financial support, this perverse tax on fatherhood subsidises the removal of dads from families. It has nothing to do with child support, when so many children have been cruelly denied the love and support of their fathers. How can we live in a country where we have equal rights for everyone, but not fathers? Fatherhood is not recognised in law or in the constitution. Unmarried fathers have no rights, even if their name is on the birth certificate. The government recently introduced ridiculous and discriminatory legislation stating that unmarried dads have to meet various ‘cohabitation requirements’ to be awarded guardianship, yet ruthlessly pursue these same dads if they miss a single child support payment. Worse still, if you have the misfortune to find yourself fighting to see your children in the purgatory that is the family courts, the court orders that are issued are rarely, if ever, enforced. Not only does this make a mockery of our idea of justice, but it’s a license for contact denial and revenge parenting, encouraging recalcitrant mothers to break the law with impunity. Whilst mothers are called before the courts when they don’t send their kids to school, the law fails to act when they don’t sent them to see their dads. Monday’s shemozzle then was the opening shot in our protest against this inequality. It was also a warning to society that they are at risk from an epidemic of family breakdown which is ripping apart families across Ireland. Sooner or later, our political elites are going to have to defuse the unexploded bomb of family breakdown and mass fatherlessness ticking under Irish society. Just when we thought we had the safe and predictable Rose of Tralee festival all figured out – the unthinkable happens. And history is made. For the first time in the festival’s 57 years – a protester stormed the stage. As Cavan Rose Lisa Reilly spoke sweetly and serenely about her boyfriend, ‘Fathers 4 Justice’ founder Matt O’Connor scaled the stage. Dressed as a priest and waving a banner, O’Connor (49) urged audience to “join him and the broken families of Ireland”.